- Title: insert the widget’s name. - Number of categories: decide how many categories will be displayed. - Style: choose the style the widget will appear: vertical and horizontal. - Order by: decide how these categories will be arranged: by name, ID, count or slug. - You can also choose to show post counts or hide empty categories. 2. RealEstate Place: This widget will display properties in your site. - Category: select the category to choose properties. - Location: select the location to choose properties. - Style: choose the style the widget will appear: vertically or horizontally. - Query: choose the way to filter the properties. • Has event: sort by properties with event. • Recent posts: sort by recent posted properties. - Number of posts: decide how many posts will be displayed. - Paginate: select the way to load more information. • Load more: click “load more” to obtain more information. • Page paginate: click the page number to obtain more information. 4. RealEstate Social: this widget will display all your social network information. 5. RealEstate Testimonial: this widget will display great words from your users. You can also decide how many posts will appear in this widget. 6. RealEstate Advanced Search: this widget will give users a hand to search the items by many criteria. =>Load more: click “load more” to obtain more information. =>Page paginate: click the page number to obtain more information. 1. Main Sidebar: This sidebar is on the right of the properties . It’s optional for you to add any widget into or just leave it empty as in our demo. 2. Top Sidebar: This sidebar will appear in many pages like category, page list review, location. 4. Bottom Sidebar: This sidebar is located on the bottom of each category page. You can choose any widget you want to add to this sidebar, you can also leave them blank. 5. 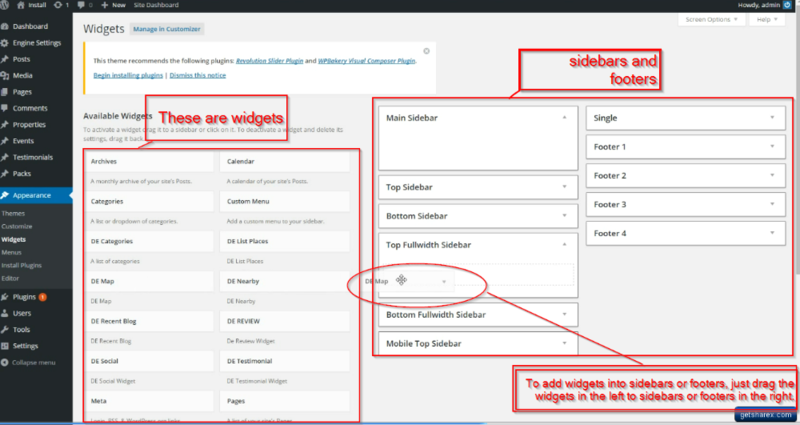 Footer: These sidebars are located at the end of each page. Mobile top sidebar: this sidebar will appear at the top of your site. Don’t forget to click “Save” button to keep all your settings.